Two events in the past day, make for interesting analysis. Bihar went to the polls and so did two seats in Maharashtra. In the former the results were a surprise. In the latter it brings about a very interesting stage in regional politics. For long, the name of Bihar has been synonymous with Laloo Prasad Yadav, and vice versa. He has ruled over Bihar, either directly or via proxy, through his wife for close to 15 years. Currently he is a major player in the game of coalition politics and is seated as a Cabinet level minister in the Railway Ministry at the Center. But in the recent elections, even with the PM Manmohan Singh campaigning for Laloo’s party, he could not pull off a win. His bete-noire, Nitish Kumar, trumped him at the polls and for the first time, there wont be a Laloo or his shadow in the state politics of Bihar. Laloo has risen to the status of being the mascot of everything that is wrong with Indian polity. A bumbling madman, more at home in the cowshed that the chief ministers chair. The jokes about Laloo are second only to the ubiquitous “sardarji” jokes, and he has gained infamy even on the international scene as India’s colourful crazy chief minister. He has his own share of scams…..fodder, et al. But then, shame on the politician who does not have a scam or two to his name. He ain’t doing his work then. Though to be very objective, Laloo is one of the few grass root politicians to have risen to the top and still have the people to people connection that most politicians lose. His totally unassuming attitude endears him to his constituents and he is as comfortable sharing a meal with them in their hut as he is fighting for their cause in the Lok Sabha. Surprisingly he has done some surprisingly positive things as a railway minister. That could be attributed to the fact that people expected so little from him that any action is one in the positive direction !! However his lackadaisical attitude to governance has reduced Bihar to be one of the poorest states in the Union. This is a really bad state of affairs (pun intended) for a region which has some of the most abundant mineral wealth, industries and farmland. The coal mines of Dhanbad, the Steel Mills of Jamshedpur and the agricultural land could have been used as stepping stones towards a more prosperous state. Sadly that was not to be. And it’s not like it cannot be done. The Tata’s have done it in Jamshedpur, India’s first and biggest private township. It did not help Bihar’s cause that in 2001, it was dealt a blow below the belt, with the splintering away of Jharkhand. Thus at this juncture in Bihar’s politics, I hope that the new government under a new steward will try to jumpstart Bihar onto the road of development it so desperately needs to be. Another election that augurs well are the ones contested for the two Lok Sabha seats in Maharashtra. Narayan Rane, the breakaway Shiv Sena man, won with a good majority, and Priya Dutt convincingly won the seat vacated due to the sudden death of her father. Not much can be said about the Priya Dutt win, because I feel this was based on sentiments. She is a political novice, with no past experience, and most people would have voted for her based on what her father stood for, and hoping that the gene pool of the Sr. Dutt continued intact to his daughter. Though, that is not something to be taken for granted. Try thinking 1993 Bomb Blasts and Sanjay Dutt in the same thought and you will know what I mean. What is significant in this election victory, is the loss suffered by the Sena candidates in both these races. The Shiv Sena is losing its grip on the state, slowly but surely. Even with all the Sena bigwigs going and campaigning against Rane, nothing went in their favour. This is not a one off occurrence. In the recent past, the local municipal elections for the Kalyan Dombivili Municipal Corporation went against the Sena. Judging by this, I feel that the supremo tiger, Bal Thakeray himself is losing his teeth. And I could’nt be more happier. To say that I loathe him would be an understatement. He is the one person singularly responsible for the downfall of Bombay as a city, in a time and age when other smaller cities are catching up and sharing some of the limelight that should rightly be Bombay’s. That Bombay is still the financial and economic capital of India, besides being its most important city is a testament to the entrepreneurial spirit of its citizens. I have heard a lot of debates about the merits and demerits of the actions of the Sena, so don’t even start about how they safeguard the interests of the “Marathi Maanus”. That’s some of the biggest hogwash, since Goebbels walked this planet. Thakeray was better at his last profession as a cartoonist. His foray into politics has created a generation of regional casteist politics in India, where the spirit of enterprise, innovation, and vision are stymied by the crap that is dished out as “looking out for the sons of the soil”. The recent bickerings within the ruling siblings of the Shiv Sena, does not bode well for a party that is so high on mass appeal. 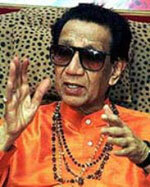 I for one would be very happy to see the passing away of Shiv Sena. In that respect, I am happy to note, not so much the win of Rane, but the loss of the Sena. I will categorically state that I don’t think that the Congress is the remedy to all evils. They live in the same neighborhood as the Sena does. But somehow the Congress is not so sinister when it comes to cultivating regional and caste-based politics. This is arguable, but I think the Congress is the lesser of the two evils. I hope that the changes in the political scenario is a movement that picks up momentum. There is no gaurantee that the new honcho will be better than the old one, but at least change takes place. And in politics, change is so very important. I don’t know if I am reading too much into these two events. What do you think ?? I rest my case. Comments are open. On the Rane – Sena duel I think there is very little for the people to choose from. I am not a supporter of Mr Laloo Yadav, however the assumption common public makes that Bihar started detoriating after Mr. Laloo Yadaav came is incorrect. even prior to 1990 most of the governments were decided by which caste – coalition succeded or failed. The only difference was that it was a colition led by upper caste who was at the helm. The law and order was better only in the sense that cities were comparitively safe while villages groaned under crime and oppression. Politicans routinely took help of criminals to settle scores or coerce voters. The reason this is not known was because it did not hurt middle classes (residing in cities)and in Indian media what doesnt effect media doesnt exist. 1990 was the tipping point , because under Mandal and Ayodhya, previous coalition got fractured and new coalition came. This coalition had its roots in village and therefore criminalization ,corruption,injustice and oppression which was never noticed earlier became visible and started gnawing at the foundation of democratic institutions. One moral ofcourse is to be vigilent and put down any spark before it burns. Other moral is to rethink our system which tends to be unneccessatily centralized. He is a typical Maharashtrain politican (or Indian politican) just more virulent. Mumbai suffers because it has to accomodate incredible amount of humanity (this I think is the biggest compliment any city can aspire to)and the money which should be spent on its infrastructure is either pocketed by leaders or spent in such noble projects as Airport in Kolhapur. In contrast Delhi has better infrastructure for the sole reason that it is seat of power.